RF or Radio Frequency is a term that is often used to describe the number of times per second or oscillation of an electromagnet radiation. Anything between 3Hz and 300GHz is still refered to as RF waves, but they are subdivided depending on the actual frequency. Microwave is the general term used to describe RF waves that starts from UHF (Ultra High Frequency) to EHF (Extremely High Frequency) which covers all frequencies between 300Mhz to 300GHz, lower frequencies are refered to as radio waves while higher frequencies are called millimeter waves. People have found a lot of uses for radio frequency waves, most of which are in the field of communications. 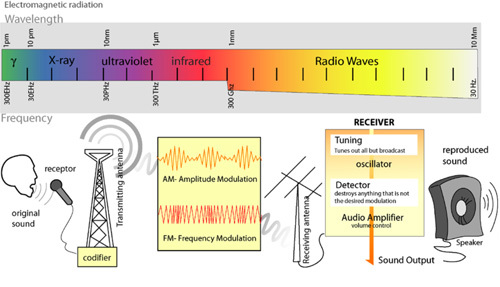 Radio waves are generally used for AM/FM radio stations due to the relative ease of using these types of waves. Microwaves which occupy the upper spectrum of RF waves have an even wider range of applications. Starting from the common microwave oven that uses microwaves to heat and cook our food, to military weapons that can heat the skin of enemy forces. But the most common use of microwaves are still in communications. The most common devices that we often use without even knowing that they are using microwaves are the WiFi routers and cards that we use to connect to our networks wirelessly. They utilize 2.4 or 5GHz RF waves to transmit data to and from our devices. Aside from that, microwave links are also used by internet service providers to transmit data from one point to another. Despite the introduction and adoption of fiber optic cables for this purpose. Microwave transmitters and receivers are still in use today in some areas. Microwaves are also being studied by some scientists today due to its capability to transmit power over the air. It is now being considered as a viable transmission method for harvesting solar power from space. To summarize, microwave is simply a part of the RF spectrum that has become quite popular due to the large number of its possible uses. Ben Joan. "Difference Between RF and Microwave." DifferenceBetween.net. October 4, 2009 < http://www.differencebetween.net/technology/difference-between-rf-and-microwave/ >. Other than for microwave ovens, RF is used to a far greater extent than microwaves for industrial heating purposes. Other than the weather stripping in your car or automobile, the bacon on McDonald’s (and similar) breakfast sandwiches, and the tempering of some frozen meat and fish, you’ll have a hard time finding things that have been heated with microwaves. On the pther hand, you are probably surrounded at this minute by products that have been RF treated: business forms, envelopes, ceiling tiles, carpet backing, book covers – I could go on & on. I teach this stuff and always start by saying that microwaves have all the glamor but RF has all the business. Sir,I’m trying to make a cardamom dryer with the help of microwave or radio wave. Please inform and guide me. Thanking you. Ha, I searched for VHF heating of food and got this as a high ranking link. Seems it was microwaveguru’s comment I got the hit on. Pity, I could have done with more details like the comparative absorption depths vs microwave ovens.